The major concern is dysfunction of the mitral valve, which connects the left atrium and left ventricle. The mitral component of the atrioventricular valve can be very abnormal and long term, the mitral valve can often result in a combination of both mitral insufficiency (leakiness) and stenosis. This valve will be closely monitored through echocardiography and may require reoperation or replacement if stenosis or insufficiency is progressive. 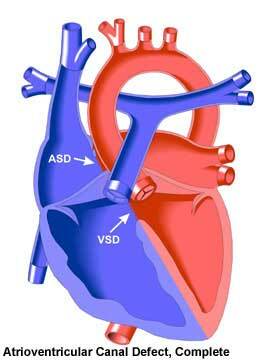 Also, approximately 10% of postoperative AVC patients will develop some degree of subvalvar aortic stenosis. Surgery to correct this problem is not uncommon and usually successful, though occasionally re-operations are necessary. In rare cases, heart block may develop in the AVC patient, either spontaneously or as a result of surgery. Heart block is a condition in which the impulses from the heart's natural pacemaker (sinoatrial node) are delayed (1st degree heart block), partially blocked (2nd degree), or completely blocked (3rd degree) as they make their way to the pumping chambers (the ventricles). If this condition occurs, then a pacemaker will be implanted.